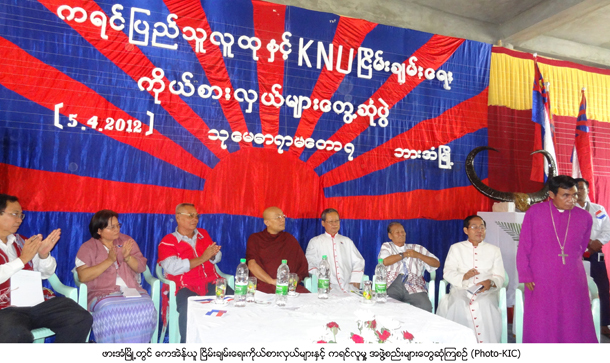 The KNU peace delegation addressed a large crowd Karen people in Hpa-an Township that included political leaders, community leaders and religious leaders. The KNU delegation explained the KNU’s ongoing ‘peace talks’ and said they sought cooperation from all Karen people in their attempt to achieve a lasting peace in Burma. The KNU secretary, Naw Zipporah Sein, said as many as 1,000 Karen people came to the Thu May Dah Ramah Temple in Hpa-an. The KNU delegations meet with Karen leaders and community representatives from the Irrawaddy Division, Rangoon, Pago, Tenithanyi Division, Papun, Hpa-an and many others township in Karen State. Among issues raised by the Karen representatives was for the Burma government to stop labeling the KNU as an illegal organization. Community leaders said all Karen people and their leaders are in high expectation that the KNU will be able to operate legally and meet nationally with their people nation in the near future. A well respected monk, Pyinnyar Tarmi, also known as Taung K’lay Sa Ya Daw, meet with the KNU delegations said. The Karen parliament member Nan Say Hwa who attended the meeting told Karen News. Nan Say Hwa said she looked forward to working with the KNU but added warning. The KNU delegations left Hpa-an and arrived in the evening to Rangoon, the delegation will stay at the Sedona Hotel. The KNU delegation along with Burma government officials held an evening meeting with diplomats, politicians, NGOs and media that was arranged by the Burma government.